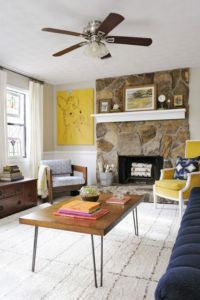 How to add color, warmth but pull the living room together into a beautiful retreat. Living room paint colors can be the most important part of a home makeover. Take some inspiration from these perfect palettes. White walls, couches and a mantel let strategic pops of color go a long way to enliven the space. Hints of coral and lime green bring life to this living room while black accents help ground the mainly white space. A wood floor in a matte finish adds visual warmth underfoot. A fabulously bold patterned rug dresses up white walls and serves as the inspiration for this room’s color scheme. Although the rug and surrounding textiles contain different patterns, they feature the same colors and therefore complement each other. Choose furniture with solid fabrics within the color scheme to add stability and separate the patterns, like this blue chair and leather-top coffee table. Inspire with an area rug. Living room wall colors should work with furniture and decor, not fight against them. In this colorful living room, pale sage walls act almost as a neutral background for other, more vibrant colors. A patterned area rug combines orange, pink, purple, green and blue and defines the color palette in this room, which helps the other accents and furniture pieces feel unified. One large piece of art on the walls adds interest to the busy space without overwhelming the palette. Grey living room ideas shouldn’t remind you of a rainy day. Use a neutral background as the canvas for pops of bright color, clean lines and funky patterns. In this living room, a coat of chic gray paint on the walls, a handsome stone fireplace and chocolate-brown tables give a foundation to the bright plants, art and accessories, which keep the room from looking cold. When you feel like a change in the color scheme, simply swap out the accessories for a whole new look. Put together a winning combo. With beige walls, mostly white furniture and a white ceiling, this living room was clean and serene. By limiting color to the sofa, pillows and a few key accessories, the room gets a wake-up call, while maintaining its serenity. While this is easy to do with almost any color combination, here, shiny gold, leafy green and navy blue stripes give the room preppy flair. Another combination, such as ocean blue and sea-glass green, could take the look beachy—or barn-red, goldenrod and taupe could go country. 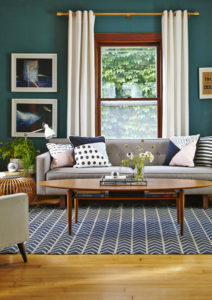 Try this easy approach to living room color ideas: commit to two main hues dispersed evenly throughout the room. Here, bold black and shimmery gold accessories are placed symmetrically to create a visually stunning space. The standout gold frame against the painted wood paneling drives the eye toward the center and makes the black and gold pair even more dynamic. Choose asymmetrical art featuring the same color scheme for an element of surprise. Try a sherbet color palette. Bubblegum pink sofas decorated with bright sherbet-color pillows makes this living room truly stand out. 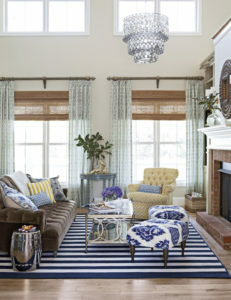 Solid gray-blue walls, a white chandelier and a geometrical bookshelf balance the splashy couch and pillows. When incorporating lots of bright, bold colors, keep balance and scale in mind so the space doesn’t come across as over-the-top. If this room were to incorporate a rug, it would be wise to stick with a neutral tone to prevent competing colors. Start with a white canvas. 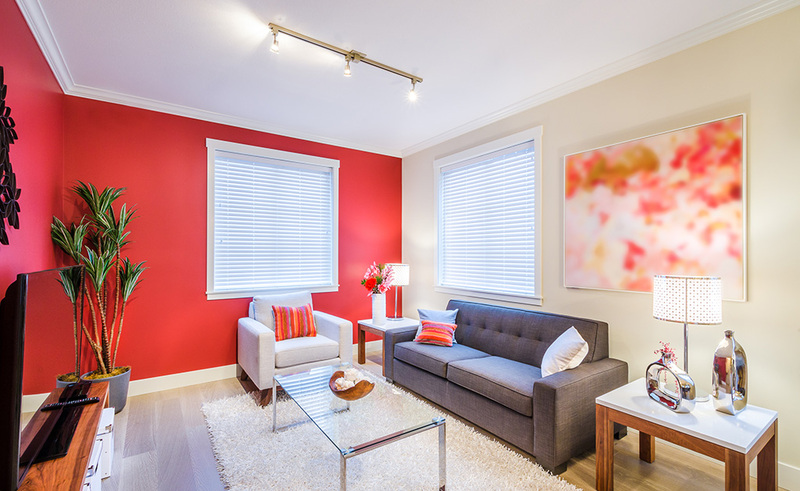 Living room colors pack an extra punch when used against white walls and sofas. A saturated blue accent wall is the starting point for the infusion of color in this crisp white living room. Rich gold, bold prints and a wild rug complement the springlike nature of the peppy sofa. Subtle metallic and mirrored accents, such as the tables and light fixtures, add shine to complete the airy, family-friendly look. Some of the best living room wall color ideas are a part of a well thought-out theme. Favorite sport teams, vacation spots or a beloved era could all influence a family’s decor style. Here, layered shades of red and blue mingle to add dimension to this patriotic space. The rustic wood beams and red-hued leather chairs give off a warm, retro vibe. Large, blank walls offer a display for art and patriotic accessories. 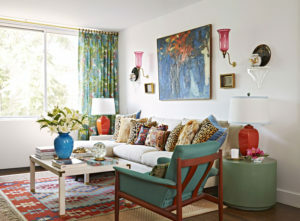 Rich blues and greens are warmed up with pops of orange-red in this small, eclectic living room. A hint of warm color can take the chill off a cool color palette. 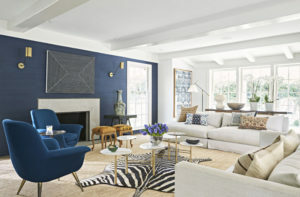 With various colors, a white sofa, leopard print pillows and a white coffee table become neutral pieces that allow saturated colors to truly shine. Tip: If you love a patterned area rug, but worry it will be a distraction, opt for a smaller size and layer it over a neutral area rug for grounding. Modern living room colors and patterns partner to infuse flair into this living room. A combination of navy, aqua and mustard yellow make for a relaxing yet vibrant color palette. 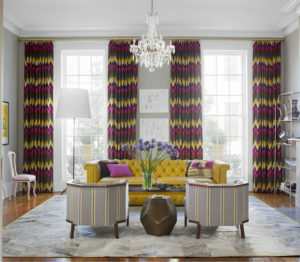 Stripes, ikat and other geometric patterns help the eye travel through the spacious room. Varying the scale of the patterns, and including large swaths of neutrals (on the sofa and walls), helps pace the exuberant look. For a color addition that’s not too strong, paint one wall and leave the others white. Here, the blue wall stands out against the white ceiling, rug and adjacent wall. The combination of blue and white invites the light from outside into the room, creating a feeling of openness. Adding accessories in colors from the same blue family helps the accent wall feel at home. Living room colors don’t need to be bright or bold to make a big impact in a space. 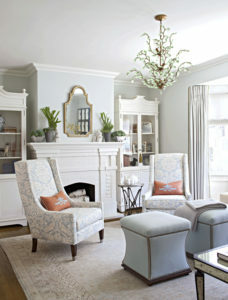 In this room, powder-blue walls and a white fireplace make a pleasant pair. Identical tall, swoop-arm chairs and flared ottomans match the color from the walls, while decorative rosy pink pillows add a touch of warmth. For a little shine, choose a bejeweled chandelier that glimmers with the natural light pouring in to complete an elegant look. Hang bright, graphic artwork to amp up the style of a cozy family room. 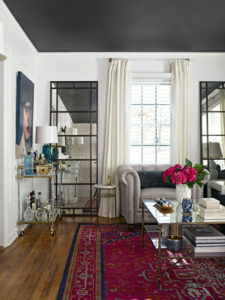 Here, a floating gallery shelf with blue prints puts a surprisingly contemporary twist on a traditionally rooted room. On the adjacent wall is proof that you can fill a bold-patterned wallpaper with artwork. The key to doing this is to keep the color scheme—in this case, black and white—consistent between the wallpaper and the print. For an easy splash of color, outfit windows in treatments with bold hues and unique patterns. 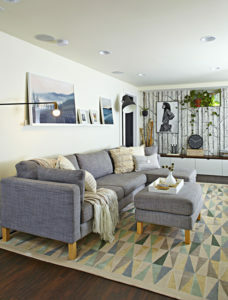 Here, unlikely chevron curtains transform this muted space into a fabulously lively living room. Place a few accessories mimicking the color scheme around the room, such as the striped vintage chairs shown here. Stacked white frames placed between the windows tie the neutral wall colors together. Tip: To make the room appear larger, hang the curtains from the ceiling all the way down to the floor. Landing on a living room color scheme can be difficult. One way to make it easy is to choose whether you want a warm or cool palette and build from there. In this cool living room, the saturated teal wall is the star and other shades of blue, violet and gray complement it. For a bit of contrast, the wood elements in the room have warm undertones that look great against their cool counterparts.